POM (Polyoxymethylene) is an engineering thermoplastic, that is recognised for its mechanical properties: it is particularly resistant and has excellent dimensional stability. POM is sometime called Acetal or Delrin. At Sculpteo, we use rectangle sheets of copolymer, a derived version of the original material that preserve its characteristics and allows us to propose the material at better prices. This material has a smooth glass-like shiny surface with a moderately opaque white color. It is not designed for aspect, but for technical properties (for example, for internal technical parts). To learn more, refer to our paragraph about uses and maintenance for the POM material. Please take a note that laser cuts the thermoplastic under a slight angle which may be visible on thicker parts. The price of manufacturing your POM design is calculated automatically at the moment your order is placed online. As you modify your object and utilize our optimization tools, you will note that the price changes automatically. The pricing is based on a series of factors, including: quantity of material used, labor required, and machine manufacturing time - to name a few. 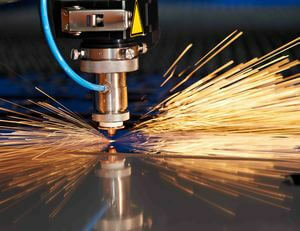 Laser cutting has a quicker manufacturing time when compared to laser engraving. Your object is estimated to arrive in 2 business days. Engraving and particularly large objects can extend the processing time by 1-2 days on average. The estimated shipping time is also calculated automatically as the object is uploaded. An additional delay can ensue depending on availability. More information can be found in the section about colors and sizing. Delivery time should be added to the processing time and depends on the delivery option you choose . Laser Cutting is a digital subtractive fabrication technique that consists of cutting or engraving a material by means of a laser. 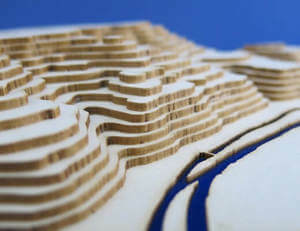 Laser Cutting can be used on a number of materials such as plastic, wood, cardboard, etc. The process involves cutting material using a powerful and highly accurate laser that focuses on a small area of the material. The high power density results in rapid heating, melting and partial or complete vaporizing of the material. Usually, a computer directs the high-power laser at the material and traces the path. Laser Engraving (or Laser Etching) is a subtractive manufacturing method, that uses a laser beam to change the surface of an object. This process is mostly used to create images on the material that may be seen at eye level. To do so, the laser creates high heat that will vaporize the matter, thus exposing cavities that will form the final image. This method is quick, as the material is removed with each pulse of the laser. It can be use on almost any kind of metal, plastic, wood, leather or glass surface. POM is a material that has several benefits, both on its ease of use and on its durability. The technical properties of POM can vary depending on the thickness but it's always very resistant and has an incredible geometrical stability. When it comes to shrinkage and tolerance. Our POM material can light up when exposed to LED lights, and is very resistant to crazing and cracking. When cutting, POM is not subject to any deformation and its smooth surface allows for a perfect cut to be easily achieved. Moreover, POM is weatherproof , waterproof and resistant to many solvent . All of these characteristics make it ideal for technical parts, in particular parts that will have to endure large amounts of strain and friction. All our POM is impact-resistant and half the weight of glass, it is also very easy to work with and can be sawed, drilled, routed, silk-screened, and formed. 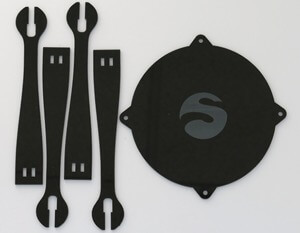 Our POM is a great material for internal parts for your projects and industry tooling and spare parts. This makes it very different from our other polymeric material for laser cutting, acrylic , which is a lot less resistant. However, POM is not ideal for aspect products as its surface is not covered by a plastic foil during laser cutting and engraving, which means that some fine scratches and some burn marks can appear on its surface. We recommend to use it as an internal part for your project. For aspect objects, we do recommend our acrylic , which comes in many colors and thicknesses, and whose surface won't be scratched or burnt as much. Technical POM is used for thousands of products due to its high quality, exceptional resistance, ease in processing and design flexibility. From automotive spare parts to gears , hinges , locks and dozens of other applications. The fact that it is waterproof means that POM c an be used in kitchens , bathrooms and for parts that need to be bathed in oil for long periods of time (typically, some motor parts). POM is easy to maintain . To clean your POM laser cut or laser engraved parts, simply use a mild soap and lukewarm water mixture with a clean soft cloth, or you can use cleaning sprays as it is resistant to many usual solvent. Our POM has a diffuse, shiny white surface which lets through roughly 30% of light. As explained above, the surface of the material might be slightly scratched and should not be picked mostly for aspect rendering. As POM is resistant to most common solvent, you can clean it with acetone. Our POM material is available in white, or black. POM is a material that lends itself to different types of operations but it cannot be painted or glued easily. Surface must be prepared and sanded in order to let the paint or glue stick to the slippy surface of the POM. It can however be sawed, drilled, routed, decorated, silk-screened, and formed. POM is a white shiny surface material and is not very suitable for surface engraving. Our Light Surface Engraving give rather good results (even if it is not quite visible, it adds a texture on your surface material). In contrast, Deep Surface Engraving tend to overflow the desired design so we do not recommend to use this technique on POM material. 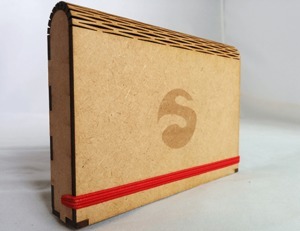 Laser cuts and engraves material by burning its surface therefore leaving a kerf. When burning the surface, the laser also leaves a kerf of a width that can vary, depending on the type of material and the thickness chosen. Because of the kerf created by the laser, a minimum distance is required between two cutting lines, in order to prevent the lines from touching or mixing. If you wish to make POM pieces fit into each other and make sure they’ll stay connected, we recommend that you add in nodes. Nodes are small bumps situated in a piece’s slots or tabs, that allow to compensate the thickness variations of the material and the kerf. Nodes get compressed when the pieces are assembled and they concentrate the friction on specific points rather than on the slot’s whole surface. This way, the slots can be larger without coming apart, allowing the pieces to stay together. It is possible to cut or engrave several objects designed in the same vector file, by attributing one different color for each action, as indicated on the tutorial how to upload and prepare your 2D file. Cardboard is a heavy-duty paper. It can be made out of various strengths, ranging from a simple arrangement of a single thick sheet of paper to configurations with corrugated layers.